‘Boom Boom’ enjoyed a glittering amateur career, winning 71 of his 77 bouts, collecting a World Youth Championship Bronze medal at 52kg, a Commonwealth Games Gold medal at 60kg and European Championship at 52kg along the way, as well as eleven National titles. The 19-year-old from Crowthorne trains under the watchful eye of Tony Sims in Brentwood, Essex and is excited to begin life in the paid code at Super-Featherweight at The O2 in London on February 2nd. 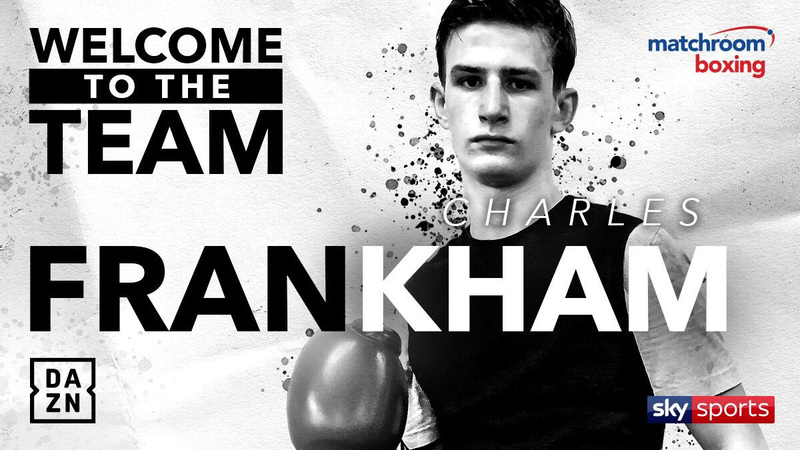 “I’m over the moon to have signed a promotional deal with Eddie Hearn and Matchroom Boxing,” said Frankham. “They are by far the best in the business and I’m confident putting my career in their hands. I can’t wait to make my professional debut at The O2 next month, I’m aiming to impress. I enjoyed my time in the amateurs but now is the right time to turn over and make my mark in the pros. “Make ‘em miss and make ‘em pay is the ‘Boom Boom’ Frankham way. My defence is one of my main attributes and I’m a spiteful counterpuncher. If I need to mix it up them I’m well equipped to do that as well. Fighting is in my blood; I was born to box. My grandad Johnny Frankham was a British Light-Heavyweight Champion and a huge inspiration to me – I intend on doing my family proud. “I’m really lucky to have a brilliant team around me in the gym. There’s great sparring for me with the likes of Martin J Ward, Ricky Burns and Joe Cordina – they’re all similar weights to me.